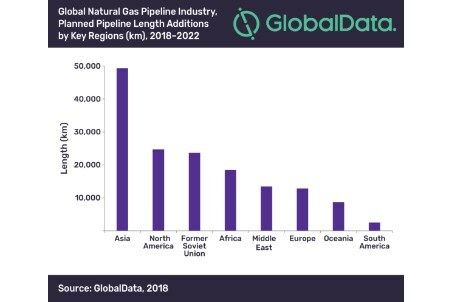 Asia will add the highest trunk pipeline length in the global natural gas pipelines industry over the period 2018 - 2022, according to leading data and analytics company GlobalData. Asia, North America and Former Soviet Union altogether are expected to account for around 63% of the global planned natural gas pipeline length additions by 2022. "Asia set to build most global gas pipelines in the next four years"
The company’s report, ‘Global Natural Gas Pipelines Industry Outlook to 2022’ forecasts that around 153 902 km of planned natural gas pipeline length would be added globally, which would take the total global natural gas pipeline length to around 1 392 605 km by 2022. Among regions, Asia is set to add the longest natural gas pipeline length of 49 321 km by 2022, accounting for more than 30% of the global planned natural gas pipeline length additions. The region has new build capex of around US$74.2 billion during 2018 - 2022. Within the region, India will have the longest planned natural gas pipeline additions of 16 827 km by 2022. GlobalData identifies North America to have the second highest natural gas pipeline length additions as well as second highest spending on planned pipelines over the same period. The region has a planned investment of around US$83.4 billion and plans to add a total length of 24 682 km of natural gas pipelines by 2022. The US will be the top country in the region with planned natural gas pipeline additions of 14 341 km during the outlook period. The Former Soviet Union will be the third highest among the global regions, in terms of natural gas pipeline length additions as well as the highest new build capex spending globally with around US$96.3 billion during the outlook period. The region is expected to add around 23 621 km of planned natural gas pipelines by 2022. Among the countries in the Former Soviet Union, Russia would lead with planned length additions of 18 219 km. The three longest planned global natural gas pipelines during the outlook period are Xinjiang-Guangdong-Zhejiang SNG pipeline in China, Russia-India pipeline and Nigeria-Morocco pipeline with lengths of 8972 km, 6000 km and 5000 km, respectively. In terms of capex, Xinjiang–Guangdong–Zhejiang SNG pipeline in China, Russia–India pipeline and Shtokman pipeline in Russia are the top three planned and announced natural gas pipelines globally, for the outlook period.